ZAP70 is a 70 kDa protein tyrosine kinase found in T-cells and natural killer cells. Jurkat cells. Tonsil or lymph node. The product protocol has a single storage temperature, but the label shows a temperature range? Which is correct? The storage conditions that a Biotium label recommends are deliberately conservative. Long term storage at low temperatures usually will increase the time that the product will remain within specification, unless specific instructions otherwise are provided (such as “do not refrigerate” or “do not freeze”). For Biotium products where the label indicates room temperature or RT, this implies storage in ambient conditions between 20°C and 30°C. For Biotium products where the label indicates 4°C, this implies storage in a refrigerator that is between 2°C and 8°C. For Biotium products where the label indicates -20°C, this implies storage in a freezer that is between -35°C and -5°C. For Biotium products where the label indicates -70°C, this implies storage in an ultra low-temperature (ULT) freezer that is below -60°C. Where can I find the expiration date or shelf life of a product? The guaranteed shelf life from date of receipt for bioscience kits is listed on the product information sheet. Some kits have an expiration date printed on the kit box label, this is the guaranteed shelf life date calculated from the day that the product shipped from our facility. Kits often are functional for significantly longer than the guaranteed shelf life. If you have an older kit in storage that you wish to use, we recommend performing a small scale positive control experiment to confirm that the kit still works for your application before processing a large number of samples or precious samples. The guaranteed shelf life from date of receipt for antibodies and conjugates is listed on the product information sheet. Antibodies and other conjugates often are functional for significantly longer than the guaranteed shelf life. If you have an older conjugate in storage that you wish to use, we recommend performing a small scale positive control experiment to confirm that the product still works for your application before processing a large number of samples or precious samples. For lyophilized antibodies, we recommend reconstituting the antibody with glycerol and antimicrobial preservative like sodium azide for the longest shelf life (note that sodium azide is not compatible with HRP-conjugates). Biotium guarantees the stability of chemicals, dyes, and gel stains for at least a year from the date you receive the product. However, the majority of these products are highly stable for many years, as long as they are stored as recommended. Storage conditions can be found on the product information sheet or product safety and data sheet, material safety data sheet, and on the product label. Fluorescent compounds should be protected from light for long term storage. If you have a Biotium compound that has been in storage for longer than one year that you wish to use, we recommend performing a small scale positive control experiment to confirm that the compound still works for your application before processing a large number of samples or precious samples. If your institution requires you to document expiration date based on date of manufacture for reagents, please contact techsupport@biotium.com for assistance. Ester dyes are stable in solid form as long as they are protected from light and moisture. Esters are not stable in aqueous solution. Concentrated stock solutions should be prepared in anhydrous DMSO (see Biotium catalog no. 90082). Stock solutions in anhydrous DMSO can be stored desiccated at -20°C for one month or longer. Esters should be diluted in aqueous solution immediately before use. Succinimidyl esters (SE) should be dissolved in a solution that is free of amine-containing compounds like Tris, glycine, or protein, which will react with the SE functional group. AM esters and diacetate compounds should be dissolved in a solution that is free of serum, because serum could contain esterases that would hydrolyze the compound. Succinimidyl esters are generally susceptible to hydrolysis, which can result in lower labeling efficiency. Heavily sulfonated dyes, such as the Alexa Fluor® dyes, DyLight® dyes and IRDyes® are particularly hygroscopic, worsening the hydrolysis problem. For example, the percent of active Alexa Fluor® 488 succinimidyl ester (SE) could be well below 50% by the time of application (according to the manufacturer’s product datasheet). In a number of Alexa Fluor® SE reactive dyes, the SE group is derived from an aromatic carboxylic acid, while in all of Biotium’s CF™ dyes the SE group is prepared from an aliphatic carboxylic acid. This structural difference reduces the susceptibility of CF™ dye SE reactive groups to hydrolysis, resulting in relatively stable reactive dyes with consistently higher labeling efficiency compared to other SE derivatives of other fluorescent dyes. Like the succinimidyl ester dyes, these dyes are also susceptible to hydrolysis, although generally to a much lower degree. Thus, for long term storage, anhydrous DMSO is recommended for making stock solutions. Amines, aminooxy (also known as oxylamine), hydrazide, azide, alkyne, BCN, and tyramide reactive dyes, as well as dye free acids, are generally stable in aqueous solution when stored at -20°C for 6-12 months or longer, as long as no compounds are present that may react with the dye’s functional group. See the product information sheets for specific reactive dyes more information. Coelenterazines are stable in solid form when stored as recommended; they are not stable in aqueous solution. Concentrated coelenterazine stock solutions (typically 1-100 mg/mL) should be prepared in ethanol or methanol; do not use DMSO or DMF to dissolve coelenterazines, because these solvents will oxidize the compounds. Ethanol or methanol stocks of coelenterazine can be stored at -20°C or below for six months or longer; alcohol stocks may evaporate during storage, so use tightly sealing screw cap vials and wrap the vials with Parafilm for long term storage. Propylene glycol also can be used as a solvent to minimize evaporation. If the solvent evaporates, the coelenterazine will still be present in the vial, so note the volume in the vial prior to storage so that you can adjust the solvent volume to correct for evaporation if needed. Prepare working solutions in aqueous buffers immediately before use. Coelenterazines are stable for up to five hours in aqueous solution. Aquaphile™ coelenterazines are water soluble formulations of coelenterazines. They are stable in solid form when stored as recommended. Aquaphile™ coelenterazines should be dissolved in aqueous solution immediately before use. They are stable for up to five hours in aqueous solution. Note that coelenterazines are predominantly yellow solids, but may contain dark red or brown flecks. This does not affect product stability or performance. If your coelenterazine is uniformly brown, then it is oxidized and needs to be replaced. D-luciferin is stable in solid form and as a concentrated stock solution when stored as recommended; it is not stable at dilute working concentrations in aqueous solution. Prepare concentrated D-luciferin stock solutions (typically 1-100 mg/mL) in water, and store in aliquots at -20°C or below for six months or longer. Prepare working solutions immediately before use. I purchased a solid dye or compound, but instead of looking like a powder, it is caked on the sides of the vial. Is it supposed to look like that? Many of our solid compounds are packaged by lyophilization, in which case they usually do not appear as fluffy powders, but form a film or coating on the sides of the vial. Simply add the appropriate volume of the recommended solvent to the vial to make the desired concentration stock solution, and swirl or gently vortex to mix. Make sure the solvent comes in contact with the inside walls of the vial to fully recover the product. ZAP70 is a 70 kDa protein tyrosine kinase found in T-cells and natural killer cells.Control of this protein translation is via the IgVH gene. 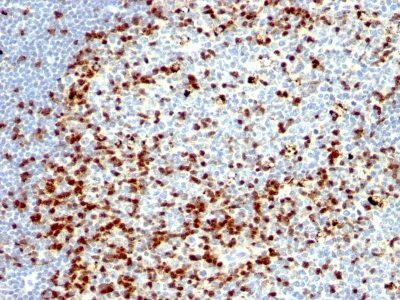 ZAP70 protein is expressed in leukemic cells of approximately 25% of chronic lymphocytic leukemia (CLL) cases as well.Anti-ZAP70 expression is an excellent surrogate marker for the distinction between the Ig-mutated (anti-ZAP70 negative) and Ig-unmutated (anti-ZAP70 positive) CLL subtypes and can identify patient groups with divergent clinical courses. The anti-ZAP70 positive Ig-unmutated CLL cases have been shown to have a poorer prognosis. Primary antibodies are available purified, or with a selection of fluorescent CF® dyes and other labels. CF® dyes offer exceptional brightness and photostability. See the CF® Dye Brochure for more information. Note: Conjugates of blue fluorescent dyes like CF®405S and CF®405M are not recommended for detecting low abundance targets, because blue dyes have lower fluorescence and can give higher non-specific background than other dye colors. Stock status: Because Biotium offers a large number of antibody and conjugation options, primary antibody conjugates may be made to order. Typical lead times are up to one week for CF® dye and biotin conjugates, and up to 2-3 weeks for fluorescent protein and enzyme conjugates. Please email order@biotium.com to inquire about stock status and lead times before placing your order. Catalog number key for antibody number 1137, Anti-ZAP70 (ZAP70/528 2F3.2) The prefix indicates conjugation, followed by the antibody number and size suffix. TrueBlack® Lipofuscin Autofluorescence Quencher, 20X in DMF, is a new reagent for quenching lipofuscin autofluorescence in tissue sections for immunofluorescence staining. It can also help reduce autofluorescence from other sources like extracellular matrix. Paraformaldehyde, 4% in PBS is a ready-to-use fixation solution for cells or tissues. It is electron microscopy-grade paraformaldehyde dissolved in pH 7.4 PBS, and is stabilized by packaging under argon with no methanol added. A revolutionary antifade mounting medium optimally formulated for preserving fluorescence of our CF® dyes and other fluorochromes. Available with or without DAPI. CoverGrip™ Coverslip Sealant is the first product specifically designed for sealing the edges of wet-mounted coverslips for fluorescence microscopy. Unlike nail polish, CoverGrip™ contains no ingredients that can leach into aqueous mounting medium and affect specimen fluorescence. RedDot™2 is a far-red cell membrane-impermeable nuclear dye similar to Draq7™, with excitation and emission at 665/695 nm. The dye is ideal for specifically staining the nuclei of dead cells with minimal cytoplasmic RNA staining. Molecular biology grade 10X phosphate-buffered saline (PBS). RNase-, DNase-, protease-free.